Ballymena United boss Glenn Ferguson. Picture: Press Eye. 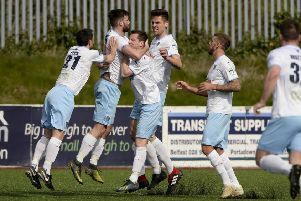 Glenn Ferguson hopes Ballymena United can continue their recent run of wins at Ballinamallard this Saturday in order to kick-start his side’s stuttering league form. The Sky Blues finally ended a dismal sequence of results at the Fermanagh venue last season when they won in the semi-final of the League Cup, before following it up with a further win at Ferney Park in the League. “It’s a tough one just because logistically it’s hard getting there but they have to do it every other week the other way. “The boys are looking forward to going down there, the pitch is immaculate, it’s always great to play on we like to get the ball down but it’s always a tough game. “But, thankfully, we’ve turned around our form down there, it was a long, long time before we got a win and couldn’t score for long enough. Ferguson hopes to have defender Johnny Taylor back after a chest infection, but he will be without Matthew Shevlin, who is in Russia with the Northern Ireland under-19 squad. “I think the only player we have now with any injury is Benny Quigg, which is good at this stage of the season,” said ferguson. * Seven Towers Supporters’ Club expresses sympathy to member Maurice Gibson on the passing of his brother David.